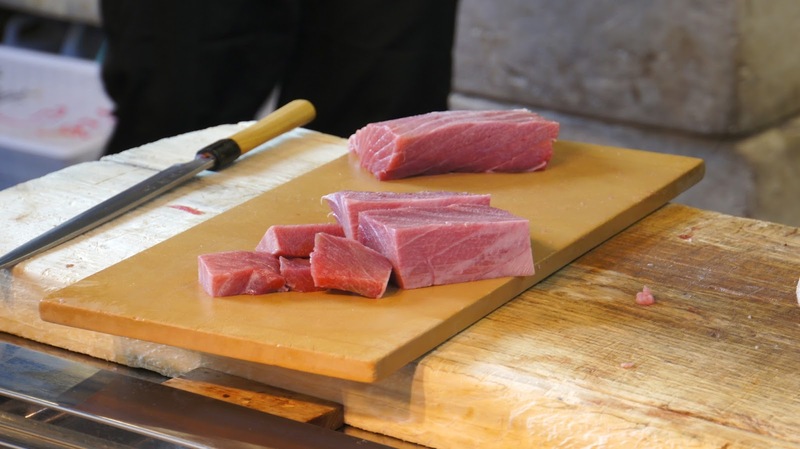 When most Americans think of Japanese food, we think of "hibachi" or sushi. I was really worried when we went to Japan that all I would encounter was sushi and foods that made me uncomfortable. Jeff will eat pretty much anything, but I have some consistency issues. I went thinking the worst and that was totally not the situation at all. The food was AWESOME and in the most unusual of places! Here are some of the most popular food and drink items we encountered that were really enjoyed. No, not the $0.25 packages that you ate in college, the real deal. Delicious broth, fresh noodles, meats or fish, and some veggies = the best meal ever! Slurping is totally welcomed and at one establishment they even offered us a bib. I had ramen at every opportunity that I could. Whether it was from a street vendor, a small nine person restaurant, or a vending machine, I wish I could recreate this at home, but I am going to leave it to the professionals in Japan. 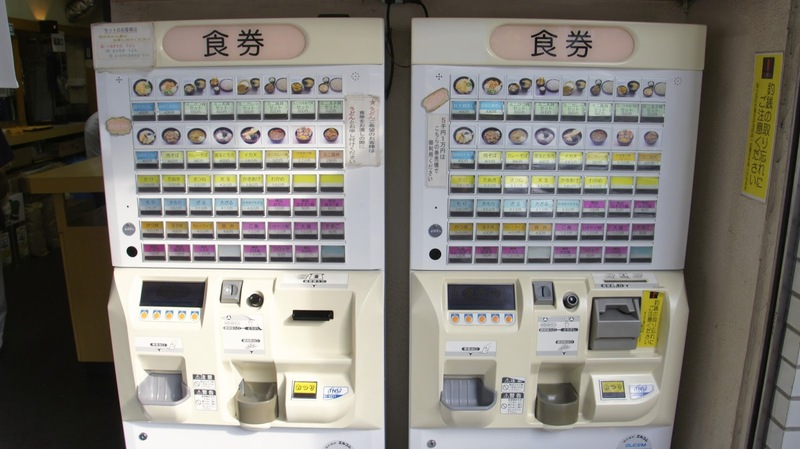 Order ramen from vending machine and eat inside. It's prepared inside. Think Wawa. The beef in Japan is referred to as Wagyu and it is some of the best in the world. The Japanese treat their cattle by feeding them beer and massaging them with shochu. The cattle are known for their marbling and quality, which is why it is more expensive. It is sold in the states, but usually the region where it comes from names it, eg. Kobe beef comes from Kobe which is near Osaka. We went to a few BBQ places, but we hit the jackpot when we went to M for Jeff’s birthday dinner. They literally showed us a picture of the cow’s identification (nose print) and the farmer that raised it. The meat was cooked right in front of us and was delicious. Typically, the customer cooks it, but tourists are occasionally served by a chef. Probably the best we have ever eaten. The fish was obviously fresh, but the main difference was the size. It was larger pieces of fish that were placed delicately over the rice, aka nigiri. Another favorite was Una Don, which was broiled eel in a sweet sauce over rice. No matter what fish you had ordered, it was always fresh and delicious, except for maybe the fermented fish Jeff ordered. Not appealing at all. Octopus balls seemed to be a big hit, particularly in Osaka. They're a small piece of octopus with breading on the outsides. Jeff got some after a night of sake, but I didn't try them because it didn't feel like having that taste linger all night. I got a whiff of this stuff every time we walked thru the subway system and always wanted to try it, but there was never enough time. Many of the major subway stations are elaborate underground shopping/food areas, nothing like what we have in the states. I was happy when we were in the airport lounge waiting for our flight home and they were serving it as a meal item that day. Some people are not curry fans, but the smell was irresistible and so was the Japanese beef curry. Served with some rice, my mouth is watering. I will be trying to make this recipe as soon as I can get my hand on the secret ingredient, Japanese curry roux. P.S. they sell it on amazon - of course they do! No, not the ones in your legs. It’s a rice or noodle (udon) bowl with tempura on top. Meats, fish (prawn), and veggies that are in a light, flaky, fried crust and then dipped into a salty broth. This was another favorite of ours on the trip. I was surprised that my favorites were pumpkin and little green peppers (nori). It all was delicious, I mean, how can you go wrong with something fried? I know, not what you expected. I have had a love affair with pickles my entire life so when they were a popular snack item at almost every place we stopped, I was in heaven. It was really hot when we visited so we often stopped and got a beer and a snack a few times during the day. Fresh pickles were almost always on the menu. Shocker, right? Kanpai! If you think about an adult beverage from Japan, many people think of Sake. Jeff and I went to Japan thinking we would be drinking Sake the entire time, but in reality the popularity of the drink has been declining for decades. We took a sake tasting class while there and we really learned about the process to making real authentic sake. The main thing we took away from the class was that sake got a bad wrap because it was being made with cheap rice, in mass quantities and made in an unauthentic manner, resulting is really sweet sake. There are breweries making it the real way and the result is delicious. You need to look for specific labels, but the price is obviously more expensive when purchased in the the US. So, instead of drinking sake as our main adult bev, we discover Shochu. This drink is a distilled alcohol which is somewhere between wine and vodka in alcohol levels and it is distilled from many different ingredients; barley, sweet potatoes, rice, sugar, buckwheat or chestnuts. It is served straight up, with water, in cocktail form, or on the rocks as we liked best. It can be up to 25% alcohol, so watch out! We have been searching to purchase this in stores at home, but we ended up purchasing it online. Every time you sit down, they offer you tea, it can be hot but it's usually cold. I know that you are probably thinking green tea and that was what I thought as well, but it wasn’t. This stuff is delicious, with a slightly roasted, sweet flavor. I preferred it cold. Every time we sat down or stood up to eat, that was what we got, not water. I enjoyed it so much that I ordered it (on amazon) as soon as we got home. Its easy to brew and delicious over ice. You should try it out. 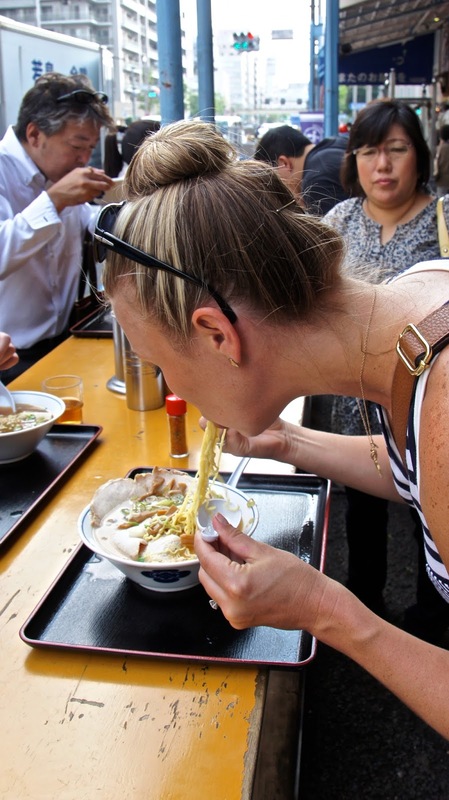 I hope you read this and realize the huge variety of food choices there are when visiting Japan. This trip really made us want to try to bring back some of these delicious foods and beverages with us. Japan really is a great place to visit...and the food happens to be amazing too!